It was a wet and miserable morning on Thursday 12 August 2010; however, we were convinced the sun would shine as the group of children I look after were treated to a visit by the Manager of Ely’s Royal Mail Sorting Office. I had planned the visit to help the children gain a fuller understanding of the important role of the city’s postal delivery service. I hosted the Royal Mail event at my setting with ten of my own minded children, as well as a number of visiting childminders and their children. 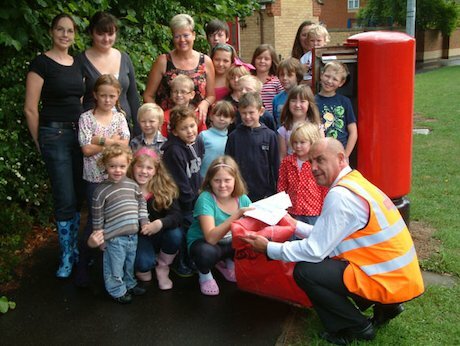 In total, 23 children and minders arrived for a fun-filled morning, during which the Manager of the Royal Mail Sorting Office, Peter Ashcroft, gave the children a rare insight into the interesting and complex journey of a letter from post box to door mat! At 10.30am the sun came out, the wet pavements soon dried and 23 very excited children made their way to the front of the setting to be greeted by Peter Ashcroft in a large red Royal Mail delivery van. The children listened to my brief talk about the safety elements of our morning and I ensured they understood what would happen during our activity.